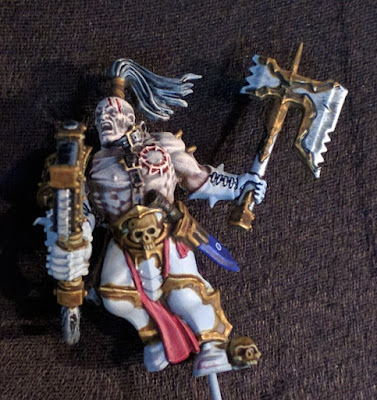 I was asked by a couple of subscribers for a better picture of my Angron kit-bash. So here it is... I made a little animated gif of him. And for those of you, whom the gif doesn't work, here are the still-shots. I will probably add more fur to the cloak and a few chains with skulls, to represent the skulls of his former comrades, left behind on Desh'elika Ridge. I will post an update when I work on the cloak. Shoulder pads pad on my World Eaters Tactical squad continues. 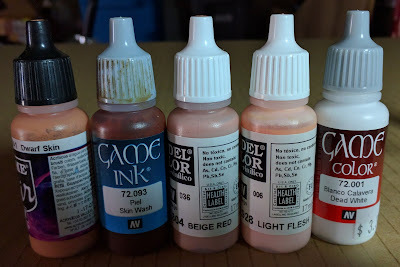 I haven't finished them yet, as it's too hot to use my Vallejo Old Gold, which dries out before I can properly apply it. I might switch the acrylic version, just to get it done. Apart from that, here is a sneak peak at my recipe for the graduated blue of the shoulders pauldrons/pads. VGA Imperial Blue - BaseVGA Electric Blue - Highlight VGA Wolf Grey - Extreme HighlightI glaze this back with a glaze mix of Imperial Blue and Vallejo Glaze Medium. VGA Dead White - Edge Highlight, if required. Work continues on the Leviathan, this time I get stuck into the base. I started with getting my rich Thousand Sons red and the obligatory skulls painted onto the base miniatures. I was asked, again, "what red was I using? 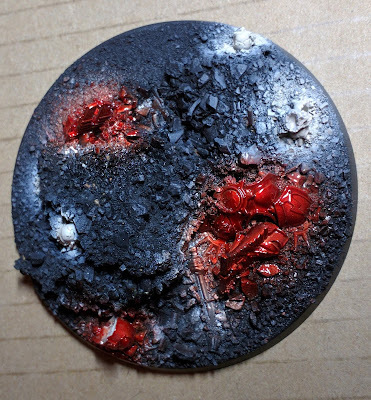 ",so I included a picture of the Minitaire Ghost Tint Blood Red, for reference, the next time one of you pop into your local FLGS. Let's hope it start cooling down out this way, so I can get stuck into painting, properly. At the moment I am stealing about 10-15 mins early morning and very very late at night, to paint. With all the hot weather we've been having, my airbrush was drying out the paint before it got to the miniature. 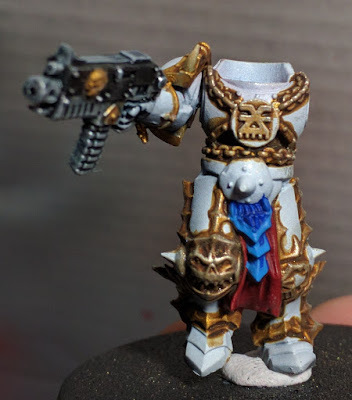 So while this was happening, I thought I would take some time to continue kit-bashing the "top brass" from the World Eaters. And this time I continued with Khârn. 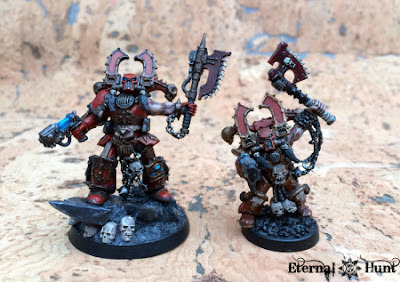 I was reading the history of Khârn and even got sidetracked on Eternal Hunt's recounting of the lore. Kudos should go to Eternal Hunt, his article was very detailed and inspiring. Chain Axe - GorechildPlasma Pistol.Hair tassles and skulls on the helmetChains everywhere, but mostly about on the wristsChest breathing apparatus.Jes Goodwin started the legacy of Khârn with his concept drawing. So given this, I set out to build a version of Khârn based on the Aspiring Deathbringer with Goreaxe. So I was trawling on Pintrest, as one does, when I saw a picture that caught my eye. A scratch-built version of Angronby Biohazard. Looking at it I realized I could probably make a version of my own. I had most of the parts, laying about. 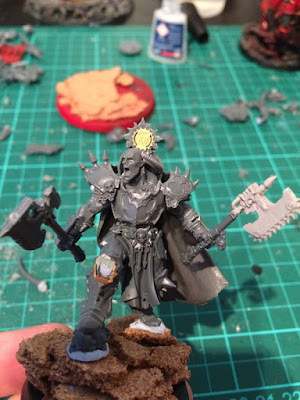 So after looking at the Slaughter Priest head, body, Blood Secrator tabard, some Blood Reaver and Wrath Monger parts, chest armor and I started building a new version. Adding the Blood Reaver, Blood Warrior axe arms and building out the Shoulder Pauldrons with a decent amount of Green Stuff. Now I just have to add the Butcher's Nails and the Chain Axes. While I was doing the skin for the Rampagers, I quickly polished off the skin on the Wolf Scouts. While I was working on these folks, I realized I should really get off my backside and finish them... maybe after I finish off the World Eater Squads. I need to bit of a change from nearly two years of painting the Wolves. Progress on the skin for the Rampagers, but first a sneak peak at the recipe I use. And this is how it turns out on the Rampagers. 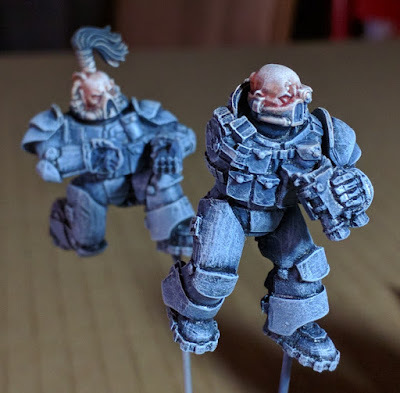 As I was already working on the skin tones for the Rampagers, I thought I would start doing the skin on the Wolf Scouts at the same time. It has been a long time since I made any real post about my efforts on Zone Mortalis. A lot of this is due to working on too many projects and not quite having good enough modelling options to rival the ForgeWorld originals. 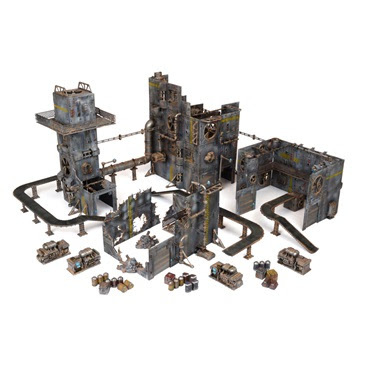 Mantic Battlezone Scenery is a fantastic alternate to the ForgeWorld Zone Mortalis boards, but they lacked a certain internal detailing that really brought character to the board. Well, that as until the made the Industrial Quadrant available for pre-order. 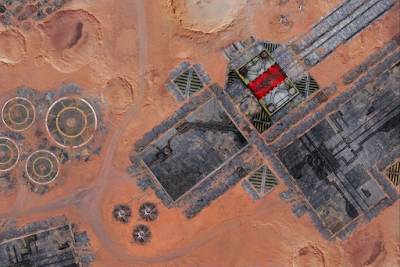 When you combine this set with the traditional Battlezones Quadrant, you should be able to make a sufficiently nice enough and modular Zone Mortalis board, if you pair it with an Industrial FAT mat. I think I will actually get off my back-side and start working on this ... well maybe after I finish up a few of my current projects <cough cough>. 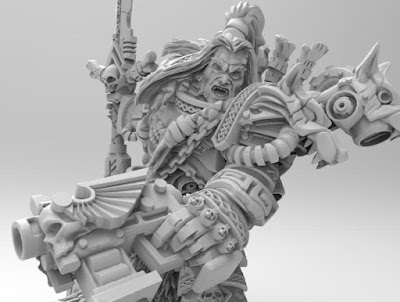 Well, finally an alternate that may do justice to Leman Russ, in lieu of the ForgeWorld release. And when that drops, will make a fantastic Ragnar Blackmane. Wargames Exclusive images were leaked by Spikey Bitz. Awesome, hey? I will be adding one to the collection, when it becomes available. 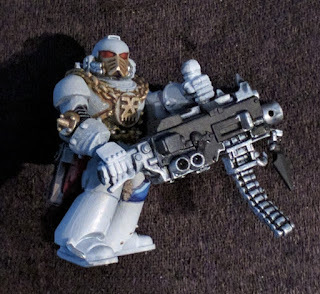 Just a quick note to let you know I haven't forgotten about my Heavy Bolter marine, just working a little slower on this one. Finally got some time to prime, base-coat with Vallejo Game Air Steel and re-coated with Minitaire Ghost-tint Blood Red. Still a little patchy, so I will have to give it a third coat to even up the color. You can see what I mean, below, as portions still look a little too silver. Thousand Sons are a lot easier to paint than, Vlka Fenryka and World Eaters. 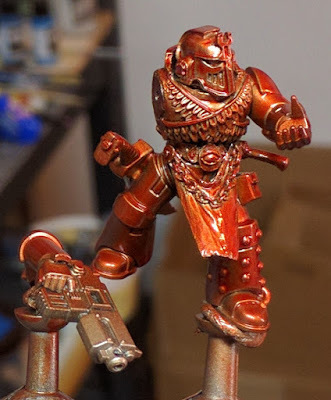 After the red, I will do my usual gold effects, and paint the tabards with a Vallejo Game Air Bleached Bone mix. My test Rampager is nearing completion. Just some final cleaning up of details, sealing with gloss varnish and ending with oil washes. This is a good thing, as I have more primed and base-coated, ready to begin. Yup. I caved. Two (2) Knight Titans and a piece of scenery for the price of a single Knight Titan box? That equation was just too tempting and a bit of a no-brainer. So what do I intend on doing? A Vlka Fenryka (Space Wolves) Knight Titan, of course, and a Traitor Renegade Knight Titan. 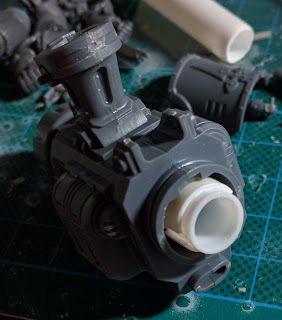 I started with working through how to magnetize/modularise the weapons, starting with the Avenger Gatling Cannon. "Why this one first?" I hear you ask. Well, I figure, regardless of whatever Knight I start building, I will be using this puppy. The Renegade can carry dual Avenger Gatling Cannons, And I want the option to swap out this, if I want to use a Meltagun or Battle Cannon. So enough with the talking, what did I do? 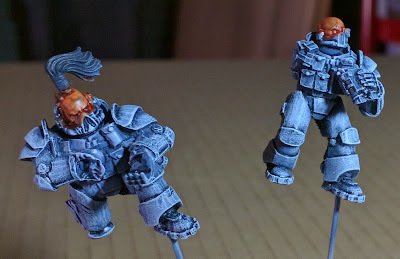 Here are some progress pictures on may World Eaters Tactical Squad Sergeant. First up the torso, legs and backpack. And no with the rest of the "bling". I still need to finish the helmet and axe. I have a shoulder pad ready to go, but I haven't attached this, yet, because I still need to work through ho I will finish up his axe.